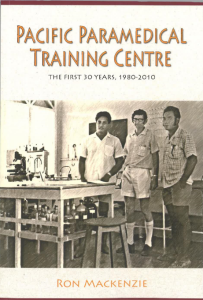 Pacific Paramedical Training Centre : The First 30 Years 1980-2010 - ubiq bookshop: the best place to buy books! The intention of the book is twofold: to provide a record of this period and to foster a continuing interest in the development of the health laboratory services of the Pacific Island and Asian regions.Despite its small size and limited resources, the Centre has become a major player in the development of medical laboratories and blood transfusion services in the Pacific Island region. It is also a small but significant part of the New Zealand overseas development aid programme.The PPTC began with the aim of providing short-term technical training programmes in basic medical laboratory disciplines which would be appropriate, affordable and sustainable and could bring immediate benefits to the work settings in which they would be used. While the PPTC has broadened its laboratory training programmes to meet the changing needs and new demands of the regions health services, this philosophy still remains the Centres focus in 2018. The Centre has international respect for the excellence of its programmes and has provided a continuing source of training and technical expertise for health laboratory workers throughout the Pacific Island and Asian regions. This contribution was recognised when the Centre was designated a Collaborating Centre of the World Health Organization in 1990 and it continues in this role to the present time.